While not the game you'd expect from the cartoon series, it's hard to find fault. Stronger crates can take several hits to clear later on, but at least those power-ups can help. I can’t help but paraphrase that beloved The Simpsons bit about Alf and pogs, not only because the two animated favorites are sister series, but also because of the incredulous reaction you might have in both cases. 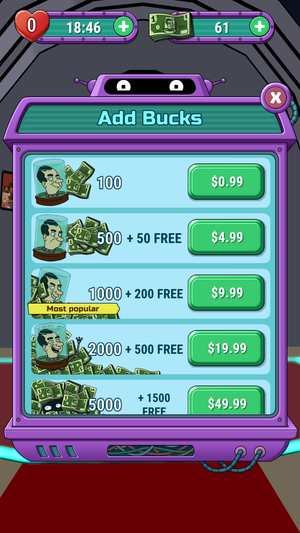 Why is Futurama a free-to-play game, especially now, three years after it went off the air for good? And why a puzzle game? Where’s the connection? As far as I can tell, there is no essential link here—besides building a game around a pretty decent pun, that is. Futurama: Game of Drones’ puzzle gameplay could be slapped with any license, brand, or visual style and make about as much sense as a Futurama match-four puzzler. But here’s the thing: Even though Game of Drones doesn’t feel like a crucial part of the Futurama universe, it’s both a pretty good puzzler and a surprisingly funny extension of the series. In both ways, I’m happily surprised. 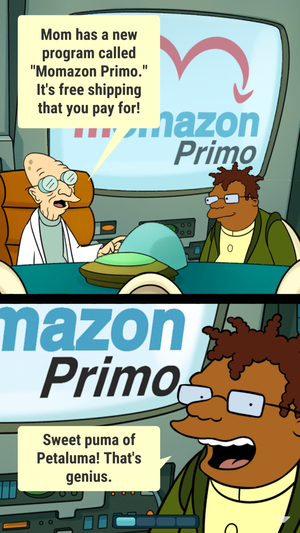 Game of Drones’ better jokes make you wish for Futurama to rise from the dead a second time. Game of Drones is a color-matching puzzler, tasking you with linking up four or more drone robots of the same type to clear them from the board. 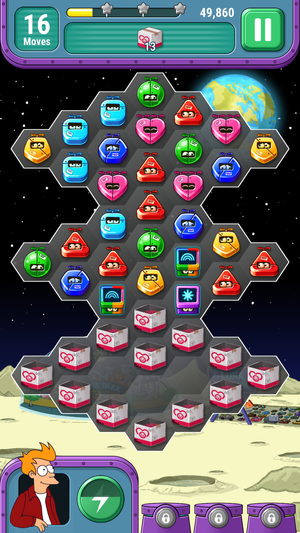 There’s little about the game that feels wholly unique, although the hexagonal grids and varying board shapes offer more variety in stage design than you might see in Candy Crush Saga and other similar games. By and large, though, your experience playing any other matching puzzler should translate over nicely. Wooga’s game has a nice array of earned power-ups that pop up if you clear five or more like-colored drones. You might snag one that clears one entire row or column, or maybe a bomb that detonates twice to eliminate nearby any drones; another can take out all drones of a certain color on the board at once. And multiple power-ups can often blend together to become extra-effective attacks that clear wide sections of the board. You can spend up to $50 on packs of Bucks each time, with bonuses given the more you shell out. Futurama keeps things lively by shaking up the objectives: Sometimes you’re tasked with clearing a set number of certain colored drones before running out of moves, while other levels ask you to destroy a bunch of crates (by removing drones adjacent to them) or guide pizza boxes to the bottom by clearing a path. You might also clear drones while battling back a growing infestation of green blobs, or trade turns against a boss character—and so on and so forth. Furthermore, each new chunk of levels is played by a different character (like Bender or Leela), offering a new special attack you can use during each level. As of this writing, you’ll find 200 levels in Game of Drones, with more promised down the line, and many of the missions are bookended by dialogue and brief comic-like interactions between the familiar characters. 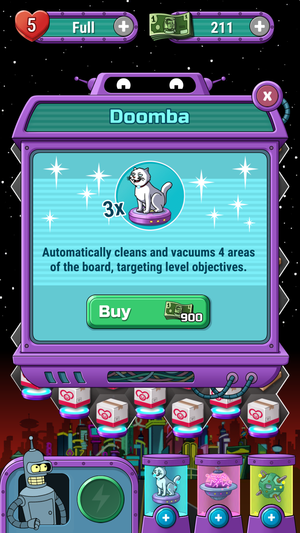 I didn’t expect a Futurama free-to-play puzzle game to have anywhere near the level of biting wit and sarcasm of the source material, but Game of Drones is really funny at times. It’s not essential canon material, but fans should appreciate the return visit. 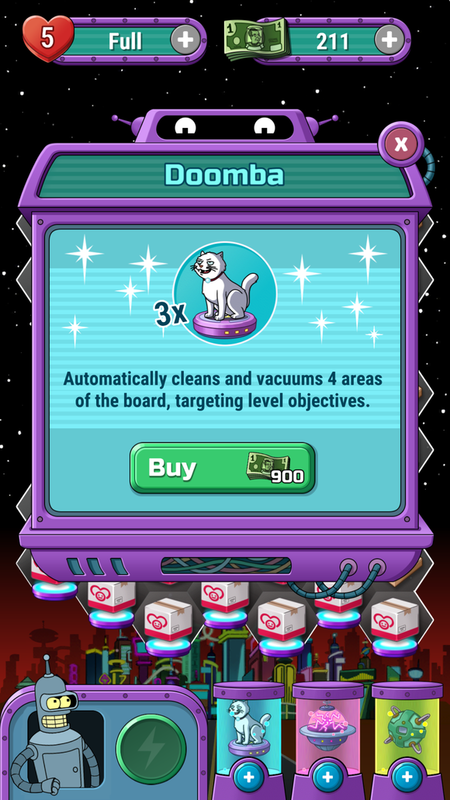 Many of the boosts are alarmingly expensive, but luckily, Futurama’s difficulty doesn’t spike too intensely. Thankfully, there isn’t much standing in the way of Futurama’s fun—at least by typically obnoxious freemium standards. Game of Drones has a lives system, with five hearts provided at the outset and one drained each time you fail a stage. They recharge at a rate of 30 minutes apiece, which is pretty standard for the genre, and you spend premium Bucks to add a few moves and continue a stage rather than fail. However, here’s the welcome part: Game of Drones isn’t nearly as difficult as, say, a Candy Crush game. True, there are times in which you might beat your head against a stage several times, trying to figure out the right strategy ahead. And there were instances in which I failed the same stage repeatedly, only a move or two away from potentially clearing it. That’s all typical genre stuff. The difference is, unlike with something like Candy Crush Jelly Saga, the odds don’t seem so hugely stacked against you that some stages seem near-impossible. A moderate amount of persistence should push you through any roadblocks. At least that was the case with the 60-plus stages I played through before spending any money—and I only grabbed an in-app purchase for the purposes of this article. Game of Drones has numerous premium boosts available, some used at the start of the stage and others available within, and they’re all pretty pricey after you burn through your couple freebies of each. Boosts cost about $1 to $3 apiece and are sold in three-packs to start, although pricier bundles can save a little bit of money. Three bucks for a single boost? I’d never spend that. The Wheel of Robots lets you watch a video ad every 10 minutes to gain free play or Bucks. Luckily, the boosts never felt necessary during the many hours that I played. I eventually pushed through all of the tough stages I encountered without spending a dime, and when I finally spent $5 on a pack of Bucks, I bought a boost and still lost the first stage I used it on—they’re not a silver bullet solution, and they don’t entirely make up for a lack of strategy and careful play. You can win without the boosts, and you can certainly lose with them: that was a reassuring realization. Game of Drones does have occasional pop-up ads for other games, some static and others animated, but they’re not too aggressive. 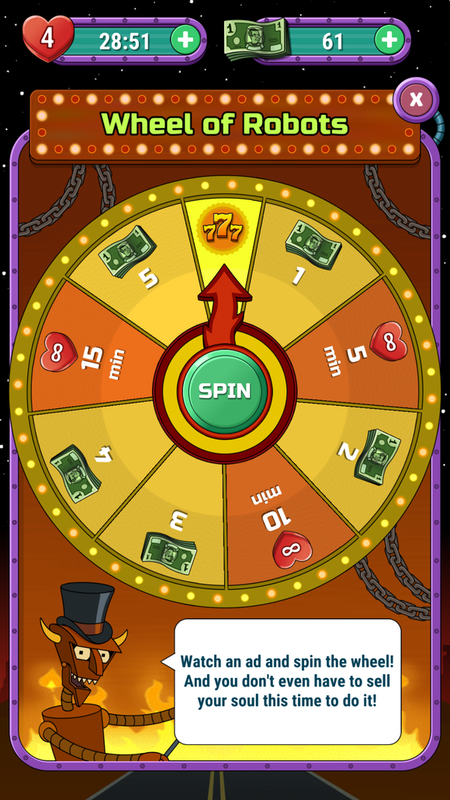 The game also has an optional “Wheel of Robots” screen where you can watch a video ad and then spin the wheel to earn Bucks or a short session of unlimited lives. It wasn’t clear on my first attempt that a video ad would play, which was a bit startling, but it’s an option for anyone who wants to eke out a little extra play time or very slowly accumulate “free” Bucks. Is Futurama: Game of Drones an essential play for fans of the show? Not exactly—the story is thin, even if the jokes are stellar, and the puzzle gameplay isn’t remarkably distinctive. In other words, you’re not missing anything critical if you opt not to play it. But if you do play Game of Drones, you might be pleasantly surprised. It’s solidly fun and has enough gameplay variety to stay interesting, plus it’s not obnoxiously misbalanced as many free-to-play puzzlers can be. The Futurama aspect of it may not make or break the game, but it adds a comforting and familiar layer to the experience. Matching puzzles might not be an obvious fit for the franchise, but Game of Drones makes it work rather well.